Custom painted by the team at Control Chaos and built in house with the help of our friends at Gigabyte, this awesome build in our Crystal Series 460X RGB chassis features everything you need to tackle your next speed run in style. Incorporating high performance components such as an Intel® Core™ i7-7700K kept cool by our Hydro Series H100i v2, 32GB of our VENGEANCE RGB DDR4 memory running at 3000MHz, a Force Series MP500 M.2 NVMe SSD, and a splash of color provided by our Lighting Node PRO that controls the lighting of our HD120 RGB fans and individually addressable RGB LED strips. 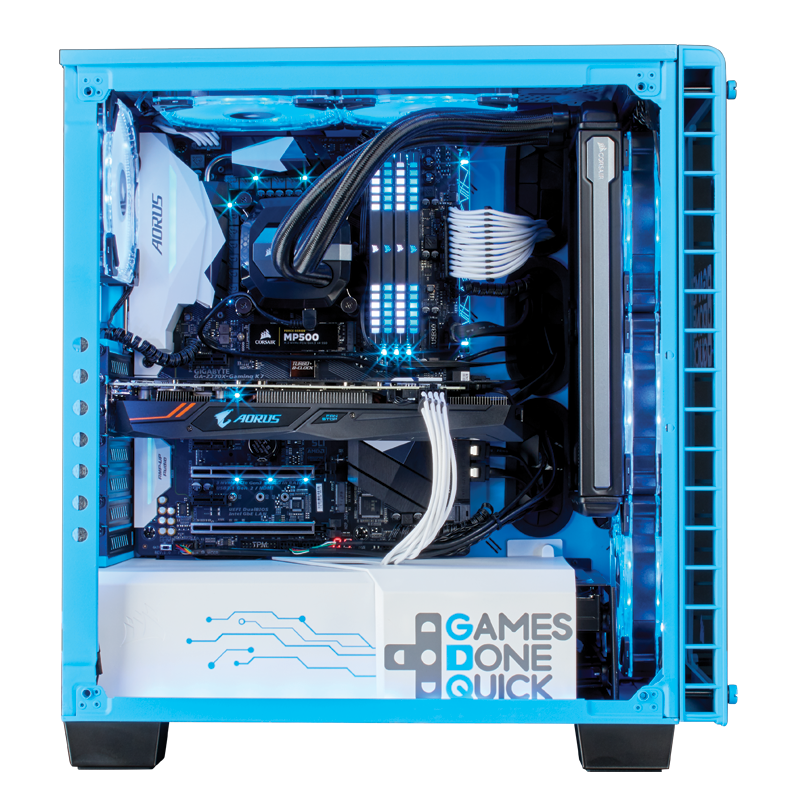 The chassis has been outfitted in Games Done Quick (GDQ) colors with laser etched tempered glass panels to commemorate the 2017 Summer Games Done Quick (SGDQ). Games Done Quick is a charity video game marathon organization that features high-level gameplay by speedrunners to raise money for charities such as Doctors Without Borders and the Prevent Cancer Foundation.